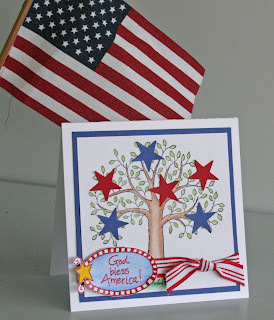 Shared Inspiration by Jill Jacobsen: Proud to be an American! We truly are so blessed to live in a free country. I want to take this time and thank everyone, past and present, for their dedication and love for our country, their willingness to give up their lives for the freedom of others. Our church just went on a missions trip to Honduras and they built 33 houses in a two week time period. Now understand that their "house" is a 16' square shack to us, and they have large families that occupy them, and they were so thankful for their homes. One little boy came up to our youth minister who was taking a break and eating a granola bar, he motioned that he was hungry. Buster, our youth minister, gave the granola bar to the boy, and all of a sudden a bunch of other boys came out to greet him also. The boy generously broke the bar into pieces and shared with all his friends, then looked at Buster and broke his small piece that he had left to share with him. Buster refused and was blessed. We have it so good, we are never hungry, and we all have warm cozy homes to keep us safe from the elements. We have more than we need, thank God that we are so blessed. Let us not forget that our freedom comes with a price. Share today with someone special, and enjoy your family and celebrations!